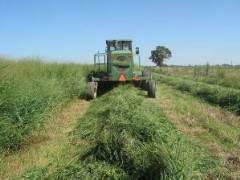 Manage weeds immediately, with mowing and herbicides, when seeding switchgrass grown for biomass. Weed competition is the most common cause of failure. Switchgrass has a reputation for being difficult to establish and requiring three years to reach an acceptable stand. Due to advancements in herbicide chemistry* and cultivar development, this is no longer the case. It is now possible, in some regions of the country, to seed switchgrass in the spring, harvest 50 percent of the yield potential of the cultivar after killing frost in the seeding year, and reach 75 to 100 percent of full production the next year after seeding. The potential for significant yields in the seeding year, and even in the second year of establishment, depends on cultivar, soils, and geographic region. In some areas with less than optimal conditions it is not recommended to harvest switchgrass until the third year after seeding. Weed competition is the most common cause of failure in switchgrass stands grown for biomass, so it is essential to manage weeds immediately during the establishment period. Weed control is inexpensive and will account for only 5 to 10 percent of your establishment costs. Mowing and applications of pre- and post-emergent herbicides can control weeds, providing there are herbicides labeled for use on switchgrass in your state*. Contact your local Extension agent for issues specific to your area. To discourage excess weed growth, do not fertilize with nitrogen in the seeding year. Switchgrass seed production field planted in June;30″rows; pre-emerge application quinclorac provided good control of grassy weeds. Broadleaf weeds sprayed with 1 qt/ac of 2,4-D on 15 July. Photo: Rob Mitchell, USDA-ARS, 4 hours after herbicide applied. Control weeds as early as possible in the establishment year to reduce competition with switchgrass grown for biofuels. Applying 8 ounces of quinclorac (Paramount®) per acre immediately after planting and before emergence provides good control of grassy and broadleaf weeds. During the establishment year, a cost-effective method to control broadleaf weeds is to apply 2,4-D at 1 to 2 quarts per acre * after grass seedlings have tillered and have about four leaves. Mowing just above the height of the switchgrass plant can also help control weeds. Mow the stand to a 4- to 5-inch stubble when weeds are 6 to 10 inches high. In the establishment year, it often is beneficial to mow weeds in early July to open the canopy, then spray with 2,4-D to control broadleaf weeds *. Weed control is a small part of production costs. In a study conducted on ten farms in Nebraska, South Dakota, and North Dakota, applying Paramount® in the establishment year reduced production costs compared with other herbicides and returned $124 per acre on a $20-per-acre investment. Always read and follow label directions, and contact your local Extension agent for issues specific to your area. After the establishment year, weeds will pose less of a management or production problem. The soil is disturbed less, and as switchgrass plants mature and develop more tillers, they will shade weeds and become more competitive. In an established, well-managed switchgrass stand, an application of an herbicide to control broadleaf weeds once or twice every ten years should be sufficient. Cool-season grasses may be a weed problem in some established switchgrass stands. For cool-season grass control, wait until switchgrass is dormant but the weedy cool-season grasses are still growing. Harvest the switchgrass high enough to leave actively growing weeds, then apply glyphosate at 1 to 2 quarts per acre* . It is important to wait until the switchgrass is dormant so that it is not damaged by the glyphosate. This treatment can also be applied in the spring, but it is much more effective in the fall, when cool-season grasses are storing carbohydrates for winter survival. The rapid growth of the cool-season grasses makes them difficult to kill in the spring. In some cases, switchgrass for biofuels may be grown on land formerly in Conservation Reserve Program (CRP) grasslands or on sites that were in hay or pastureland. One way to eliminate the CRP or other grasses to prepare for seeding to switchgrass is to spray in autumn prior to killing frost with 2 quarts of glyphosate per acre *. The next spring, apply prescribed fire to reduce the residue, but only if fire is permitted in your area. Another option is to apply glyphosate in the spring, followed by direct seeding with no-till or conventional tillage. A management practice accepted by the Natural Resources Conservation Service (NRCS) in Nebraska and other states is to plant glyphosate-tolerant soybeans in the spring, into the grass sod using minimum tillage. Managing the land in soybeans requires an extra year of planning but will provide a crop return on the site and prepare an excellent seedbed for switchgrass establishment in the following spring. Soybeans also add nitrogen to the soil, and the seedbed does not require tillage, maintaining the soil carbon which is important on these CRP sites that likely are highly erodible. Be aware that some states have no herbicides labeled for use on switchgrass. Check with your Extension agent or other experts for information on which herbicides are labeled for use in the state and county where you will be using them. Mention of trade names or commercial products in this publication is solely for the purpose of providing specific information and does not imply recommendation or endorsement. Always read and follow label directions and precautions for safety, effective control, and legal use. It’s critical to control weeds before and during establishment switchgrass grown for biomass, because weeds are the most frequent reason a stand fails. You should have few problems with weeds in established stands. Control weeds with mowing and applying pre- and post-emergent herbicides, if permitted in your state. Land in hay, pasture, and Conservation Reserve Program can also be converted to switchgrass with judicious use of herbicides and management practices. Effects of seeding date and weed control on switchgrass establishment – Curran, W.S., Ryan, M.R., Myers, M.W., Adler, P.R. 2012. Weed Technology, 26:248-255. Establishing and Managing Switchgrass – University of Wisconsin Extension.